Hostages running towards the Police. Third week of December didn’t start well for Australians as they were enveloped by the sombre mood in the wake of the lone wolf attack in Lindt Chocolate Cafe in Martin Place, one of the busiest places in Sydney, the financial capital of Australia. 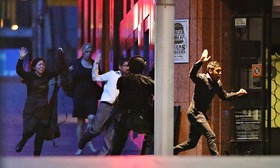 The terrorist seige taking 17 employees and customers hostage by the lone gunman, Man Haron Manis with alleged loyalty to ISIS, has been overwhelmed by The Sydney Police in 16 hours with 3 confirmed dead ( two customers and the gunman ) and 4 others injured in the process. This is the first instance of a terror attack since the Australian PM, Tony Abbott, raised the ‘country’s alert level’ tightening restrictions to even news reporting on national security matters following the statement of an Islamic spokesman prompting Muslims in Australia to carry out individual attacks in September this year. 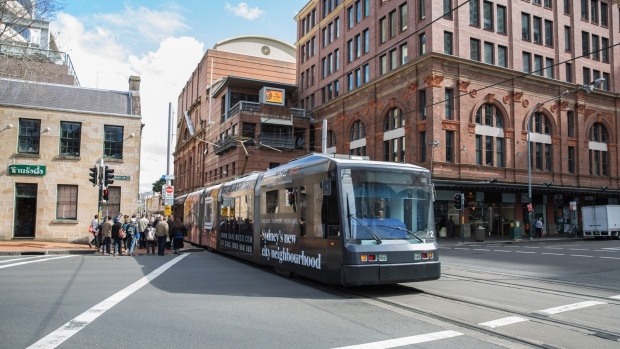 Australians show solidarity with Muslims by riding with them in public transit. Two aspects merit attention here in respect of an excellent display of EMERGENCY RESPONSE, to such barbarious attacks, by the ever resilient Sydneysiders/Australians and the public world over. 1. The hashtag expressing solidarity with the city’s ( and the country’s too ) Muslim population – # illridewithyou – to ensure there is no immediate reprehensible and retaliatory actions precipitating the event further. 2. Twitter users’ support for Muslims garnering more than 3,00,000 tweets ( at this time of writing ) across social media to bring the temperature down. Fear, anxiety, stress, sleep deprivation, uncertainty, confusion, and tension need to be replaced by a ” sense of calm ” – a psychologist says as important in such situations. Hostages and their families need all the support possible – she adds. It is also important to keep a strict vigil on children’s behavior to maintain their mental health in the wake of such disturbing events. The gunman was the 49 year old, Man Haron Manis, living in Southwest Sydney, originally from Iran, a self proclaimed sheikh, charged with accessory in the murder of his ex wife who was allegedly stabbed and set on fire on a flight of stairs in her western Sydney apartment block. He was also arrested for the sexual assault of a 27 year old woman in 2002. How he has been walking the streets freely in Sydney and Australia without imprisonment is perplexing to say the least. Katrina Dawson and Tory Johnson, two civilians who lost their lives in the seige. 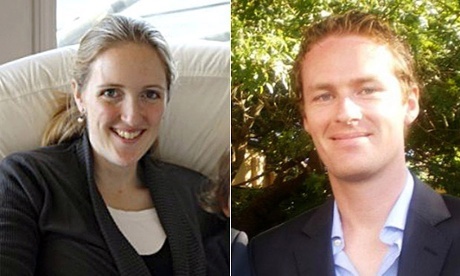 Two civilians who lost their lives include (a) Katrina Dawson, 38 year old mother of three, hailed as one of the best barristers in Sydney; and (b) Tori Johnson, 34 year old manager of the Lindt Cafe where the incident happened. PM Tony Abbott could not say anything more than the act being a ” politically motivated one ” at this juncture without giving in to speculations or imaginations. Guardian Correspondent, Chulov, in a pre analysis had this to say : ” More Australians per capita than almost any other nationality have travelled to join ISIS and Jabhat al Nusra ” – a statistic that will caution the government and will circle round the grey cells of the intelligent community as a whole. He adds : “There is a small and ill defined number of citizens in the mix ( of threats to Australia ) – those who have developed grievances over the past decade and are willing to hitch themselves to a terror group’s cause to settle permanent scores. ” Man Haron Monis may well fit in this category. I may well personally like to see a situation at this time of deafening silence from the Muslim community to also come out easy with a statement ( from the entire Australian Muslim Community ) condemning this heinous, un-Islamic act of terror and horror against non-muslims as well as their own fellow Muslims in one voice. It takes monumental strength and extreme courage to not be fearful and strive to unite as one Australian ( mankind ) and connect with each other for peace and harmony. In any event, this attack should not be allowed to become a serious concern about a ‘new breed’ of ISIS in Australia. It should be nipped in the bud. Tidbit : Peace, Progress and Prosperity anywhere, anytime, for anyone.